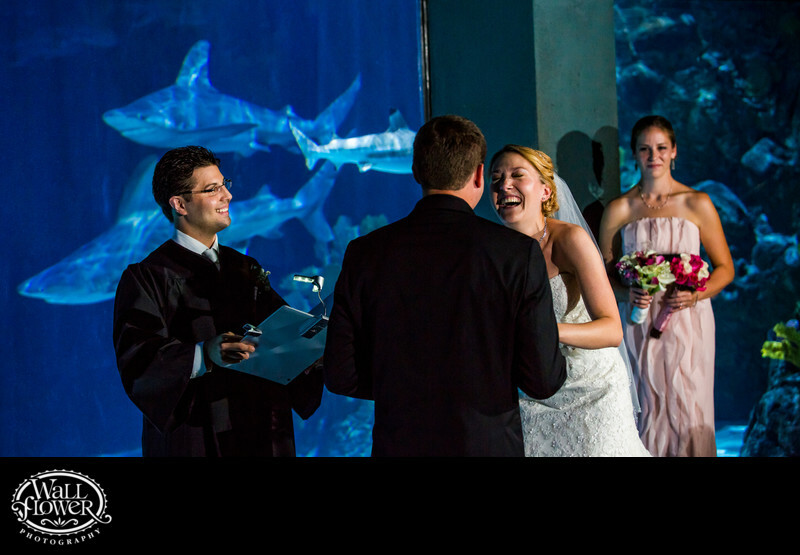 There are few wedding venues more stunning — and more unusual — than the South Pacific Aquarium at the Point Defiance Zoo and Aquarium (PDZA) in Tacoma, Washington. The dark, crowded windowless room in front of the shark tank is also one of the most difficult venues for photographers. We used multiple radio-controlled Speedlites on strategically placed stands to provide the burst of light needed to freeze the bride's motion as she busts up laughing at something her brother the officiant had just said. Meanwhile, sharks silently glide by in the deep blue behind them. We've also had the privilege of photographing the weddings of the bride's brother and maid of honor in previous years! Check the Places photo gallery on this website to get a wide-angle look at this wedding ceremony. You'll also find a few engagement portraits of this couple, also photographed at the PDZA, in the Engaged gallery.